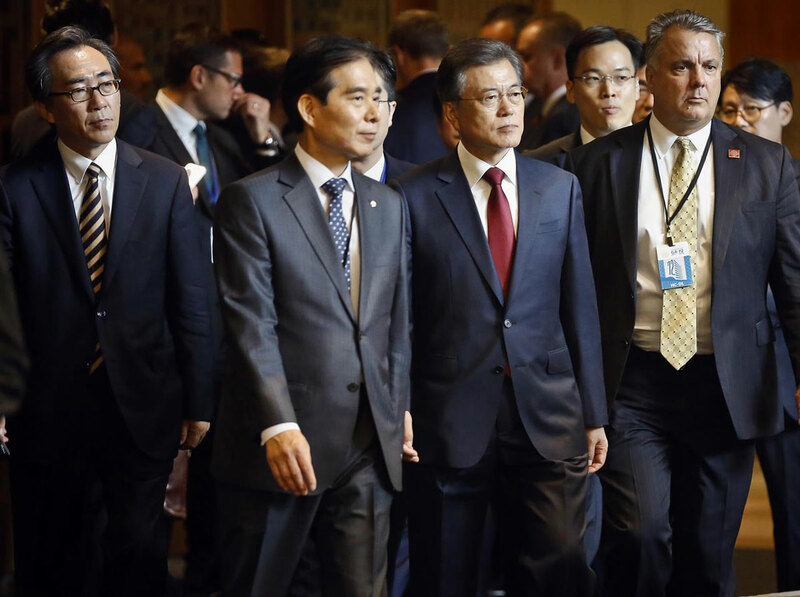 Japan urged international unity Wednesday in pressuring North Korea to give up its nuclear weapons, even as another key U.S. ally pushed back against President Donald Trump’s threat to “totally destroy” the rogue nation if it attacked. Japanese Prime Minister Shinzo Abe devoted his entire speech at the annual gathering of world leaders at the United Nations to North Korea, which has launched two ballistic missiles over its eastern neighbor in the past three weeks. Abe told the U.N. General Assembly the “gravity of this threat is unprecedented.” He appealed for nations to fully implement U.N. sanctions that were tightened last week after the North’s most powerful nuclear test to date. “North Korea’s nuclear weapons either already are, or are on the verge of becoming, hydrogen bombs,” he said, predicting they could “sooner or later” deliver them by intercontinental ballistic missiles. Abe voiced support for the U.S. stance that “all options are on the table” and echoed the Trump administration’s position that aid-for-disarmament negotiations with Pyongyang in the past two decades have failed. This year’s annual gathering of world leaders at the U.N. has drawn myriad condemnations of North Korean leader Kim Jong Un as he accelerated the pace of weapons testing while seeking to perfect a nuclear-tipped missile that could strike the continental U.S.
German Chancellor Angela Merkel, who is not attending the General Assembly, told a German broadcaster that she “clearly” disagrees with Trump’s threat Tuesday to destroy North Korea if the U.S. is forced to defend itself or its allies. Instead, she offered help in negotiating a solution with North Korea, noting that Germany played a role in talks with Iran to limit its nuclear program – a 2015 agreement that Trump described as an “embarrassment” heightening expectation he plans to walk away from it. Vice President Mike Pence reiterated Wednesday American willingness to use military force if required. He said the U.S. was will continue “to bring the full range of American power to bear” on North Korea, marshalling economic and diplomatic pressure to demand it abandons its nuclear and ballistic missile programs. “If we are forced to defend ourselves and our allies, we will do so with military power that is effective and overwhelming,” Pence told the Security Council. British Prime Minister said that despite the adoption of the toughest U.N. sanctions yet on Sept. 11, North Korea continues to defy the international community and threaten its neighbors. May’s comments appeared to be directed at China, which accounts for 90 percent of North Korea’s external trade and supplies most of its oil. Beijing opposes the North’s nuclear program but fears more economic pressure could cause its wayward neighbor to collapse. Along with Russia, it is urging the U.S. to launch dialogue with Pyongyang. U.S. Allies Divided Over Trump’s Threat Against North Korea. Japan urged international unity Wednesday in pressuring N.K. Other Key U.S. allies pushed back.